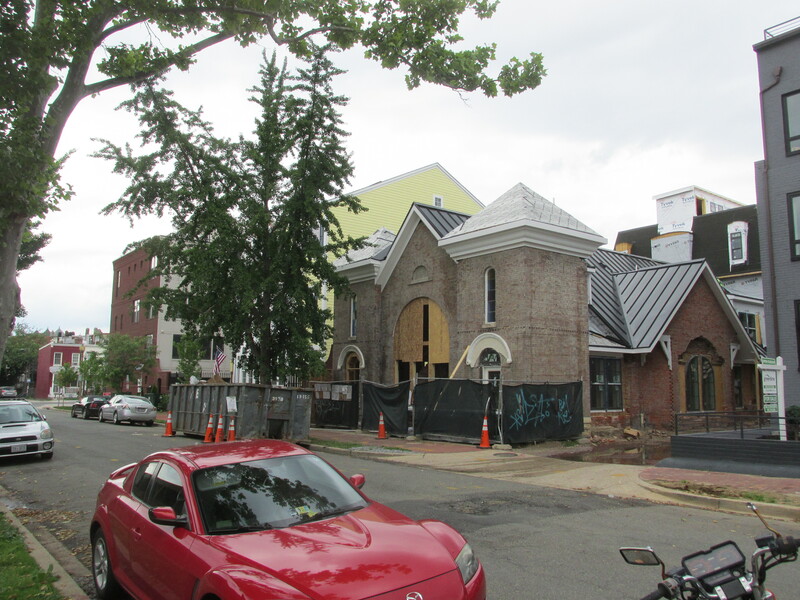 Checking Out the Progress at Morton Street Mews and the old Pittman Church | Park View, D.C. The Morton Street Mews project at the northeast corner of Morton Street and Sherman Avenue appears to be in the final stages of the development, with most of the construction centered on the old church structure designed by William Sidney Pittman. Overall, I’ve been impressed by this project and liked what I saw when I visited the Sherman Avenue flats in January. While the original church structure structure is getting some new architectural embellishments and an addition at the rear, I’m grateful that the developer was able to keep it and incorporate it into the final plan. This entry was posted on May 31, 2016 at 7:01 am and is filed under Development, Housing. You can subscribe via RSS 2.0 feed to this post's comments. Not to change the subject (but I will! )… what’s the deal with Reliable Tavern on Georgia Ave? Joe Englert was supposed to open a new tavern there last year, but it looks like construction stalled out some months ago. Now it’s an eyesore with plywood because the (brand new) windows were vandalized. …to add to the bad development news, the Warrenton Group has removed all reference to the redevelopment on the corner of Georgia Ave and Princeton Place NW from their website and their demolition permit will be expiring in a month. I emailed them several times in the last 2 weeks, and Warren Williams who has always been responsive to me (because he grew up in my house) has not replied. I’ve been pleased with the Morton Street Mews. I’ve watched Opal do a proper job building these units with QUALITY construction (unlike a few popups nearby). It shouldn’t be such a anomaly but it is with developers these days.